Whitton Apple Fest 2016 (16th October) is a celebration of all things ‘Apple’. The Fest is an opportunity for our small North Lincolnshire Village to get together with friends and family to enjoy a day of Arts, Crafts, Food and Local Brewed Cider. 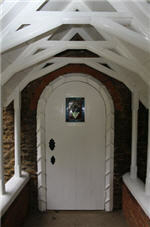 The aim is to have fun and raise funds to help keep our Village Hall alive. Last year we raised almost £1300 and this year we’re hoping to raise even more. This is only our second year and we couldn’t have done it without the help and generosity of our sponsors and supporters. This year we plan to dress a tree with knitted Apples, to add some ‘festivalness’ to the days leading up to the Apple Fest. 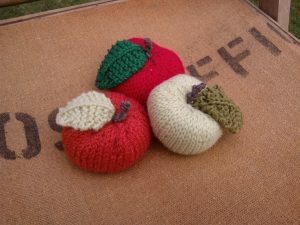 If you love knitting, you can get involved by knitting an apple for our tree. In return we will add your name to our special thank you page on our website – along with photos of the tree in full knitted splendor. There’s no restriction on colours or sizes. Surprise us with your creativeness. Once your apple is done – please send it or drop it off to Whitton Apple Fest. 1 Post Office Lane, Whitton, North Lincolnshire. DN15 9LF UK. If you are sending the apple over a long distance and want to keep the posting cost down, leave out the stuffing and we’ll add it for you. 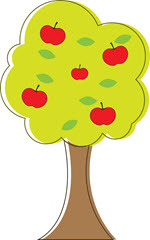 It would be amazing if we can cover the tree with hundreds of apples – might even make the local news! The other great thing is, we will sell off all the apples for £1 during the Festival day – to raise funds for the Village Hall.